2016 is done and gone and 2017 is here in full swing. Here are some wedding trends we see that are making a huge appeal this wedding season! Vintage is making a comeback with couples looking for unique ways to mix together old and new. The use of extravagant centerpieces, flowers with pops of color, twinkling lights and candles add the new and modern twist to vintage and rustic designs. 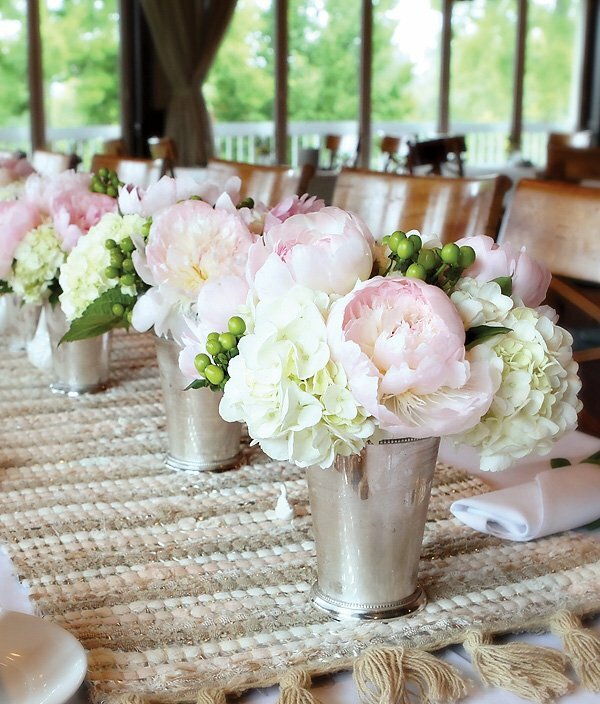 Soft petal flowers such as Peonies, garden roses, ranunculus, and dahlias are in this season and are on high demand. The soft colors add a pop of elegance to the occasion and embody romance. 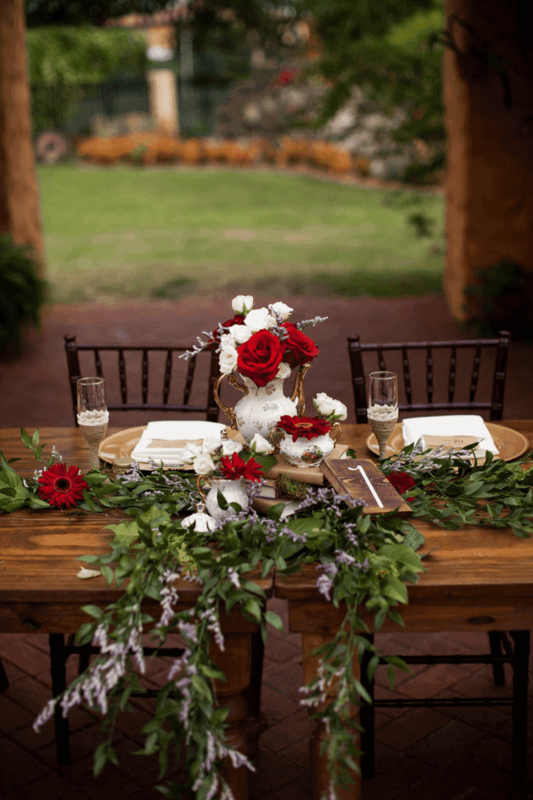 Garlands are also making a huge comeback, adding a garden feel to your wedding and really allowing you to play with different colors and flowers. The taller the better. Couples are looking to make a statement with their centerpieces and keep the guests looking up. Tall glass trumpet vases are in again, giving the couple an opportunity to create large, bountiful arrangements that really catch the eye. Candelabras and other decors such as chandeliers, low hanging string lights and Edison bulbs help take advantage of vertical space above the table that really catches the guests’ attention. Metallic accents are still staying strong this season. Colors like copper, rose gold, and pewter are so versatile and mix well with other colors. They also provide a sophisticated and vintage feel to the event. Just adding a pop of metallic accents to your décor can really catch an eye. All white weddings are a thing of the past now with brides leaning more towards neutral tones of greys, blues, and cream. 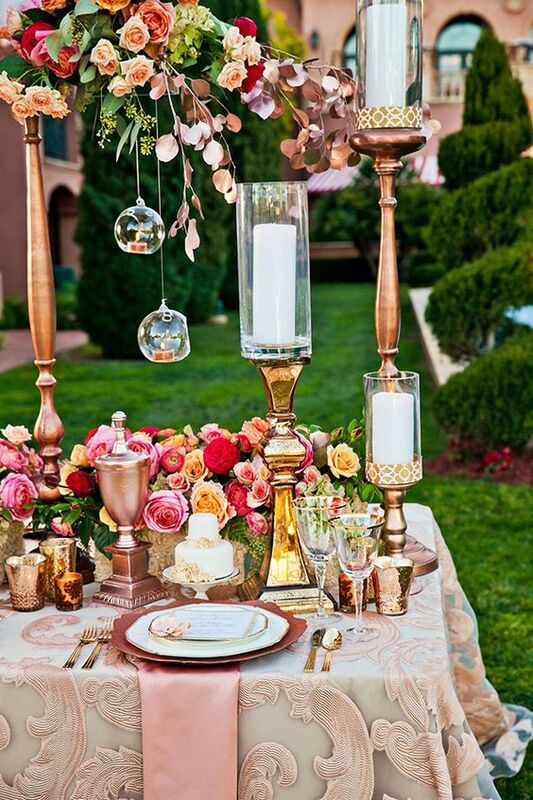 Adding a hint of color with blush rose pinks, metallic and glass to really make the colors pop. Another color trend we are seeing is Pantones Color of the Year, Greenery. This refreshing and revitalizing shade welcomes in the New Year with and new beginnings. This color blends beautifully with neutral tones and white and give the event a beautiful garden atmosphere. We are seeing traditional tall cakes make a comeback. The nostalgia and elegance of the tall cakes appeal to brides who are going for that classic look. The height of the cakes add a strong visual appeal to the dessert table and provides a focal point. Naked cakes are still going strong, their unique look and beautiful garnish keep them popular. We are also seeing a change in the traditional candy bar stations. Instead of just offering guests one type of cake we are seeing cake stations with an assortment of cakes for guests to choose form such as coconut, key lime and salted caramel. With new and growing technology comes new ways for brides to spice up their special day. Snapchat Geofilters are a huge deal now, providing a way to personalize photos and snaps on social media. 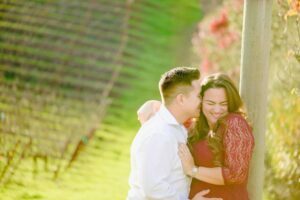 Professional photographers are also diving into the new technology such as with Instagram Video edit packages provided through their services. This services creates a 60-90 second cinematic video that represents the special occasion. The use of drone technology is taking the wedding industry by storm, providing a unique aerial shot that is unlike any other. Whatever themes and colors you choose to incorporate into your day just make sure it tells your story. We hope you take these ideas and create a concept that will best embody you and make this event unique. After all, it’s all about You!